Over Thanksgiving I had a chance to work on my row by row quilt with PKM fabric. My math turned out okay (so far) in joining my blocks into rows. 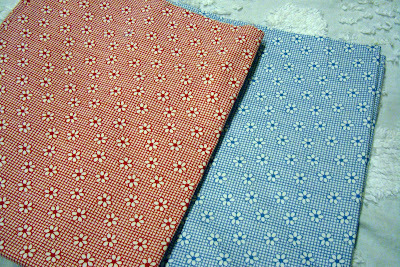 Next step will be joining the rows together. I have a couple filler rows to add in, too. I am hoping it comes together as I've outlined. 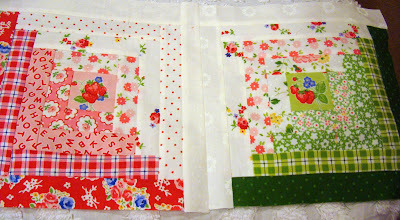 I loved making all the blocks and it was a perfect project to use with Pam's fabric. You can see that the log cabin blocks are making up the border. Because I had an odd number of blocks in the top and bottom rows I made a solid color (blue) center keystone block. I wanted the border to look like a wave all around the edges. 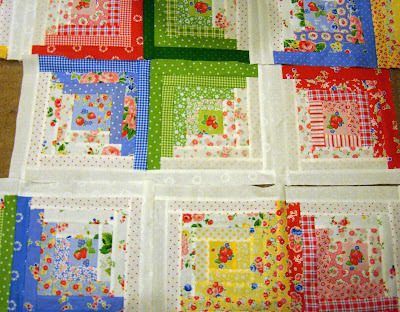 I plan on getting the top quilted before Christmas so I need to wrap it up soon. 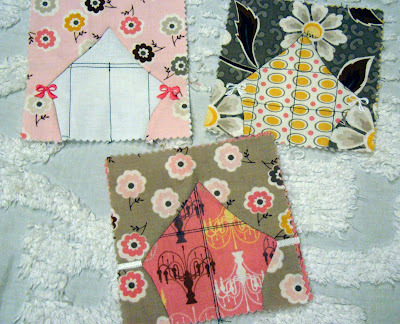 Happy quilt with happy fabric. 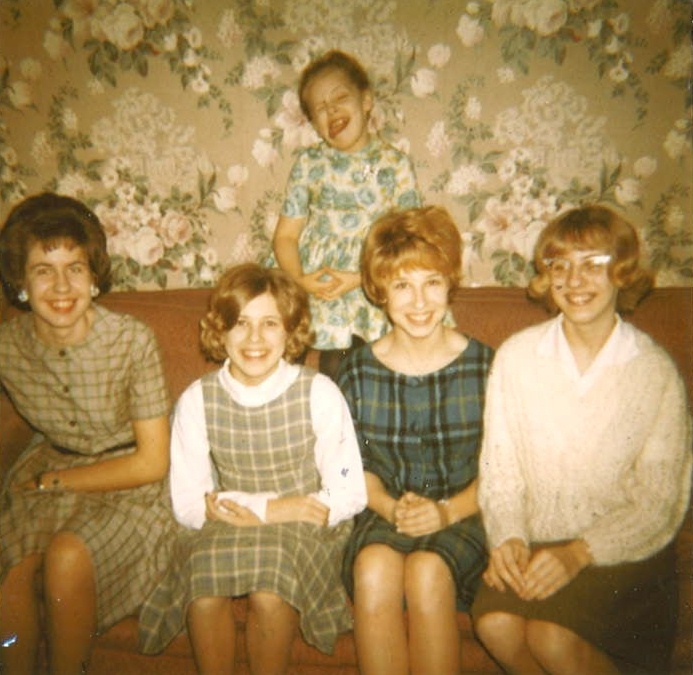 Speaking of happy...Happy Birthday to my sister, Michelle. Are you sick of turkey and pie? We had a really nice Thanksgiving. I hope you did too. A few weeks ago we took the pie class at my friend Laura's. (she has recipes posted BTW) We used Laura's pie crust recipe and method. It worked perfectly, except that Shelbie ripped open her thumb on the food processor blade. 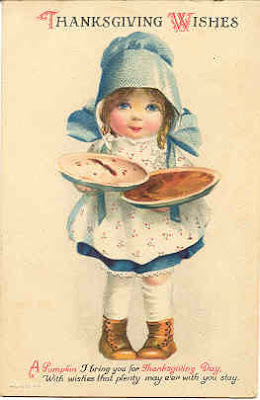 But that aside, the pies were great. I told you I've never made great pie crust. Well I hope that is all in the past. My father-in-law always makes pumpkin pie for us. His is great. But I finally made really good pumpkin pie. I tried a trick I want to pass on. 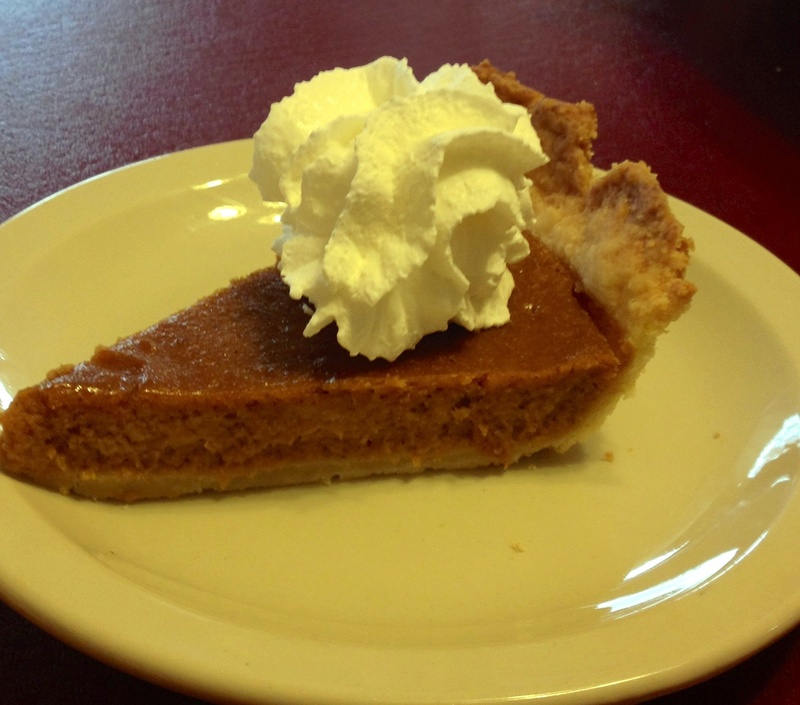 Use your favorite pumpkin pie recipe. Before putting the ingredients together, cook your canned or fresh pumpkin in a sauce pan for 10 minutes. That will make sure your pie sets up in the center with no mushy texture. I still baked the pie for nearly 40 minutes and it turned out wonderfully and cut into a perfect slice. We got our Christmas decorations up, too. It was really a productive weekend. I love having Christmas in my entry way. 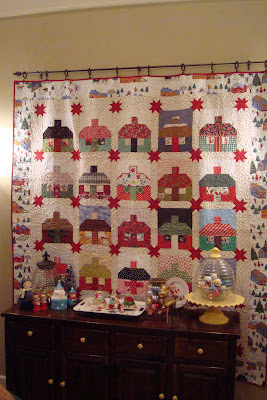 Here is (again) my Christmas Cottage exchange block quilt. It is really special to me. I have my favorite Christmas things set out on the side board. New this year is the gold dear from Barbara's etsy. 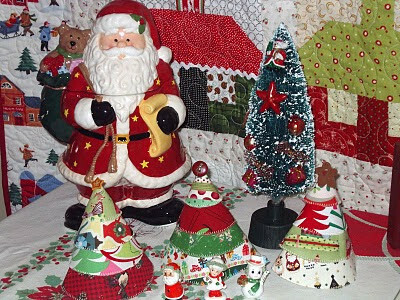 You can't beat Oodles and Oodles for a great vintage Christmas. 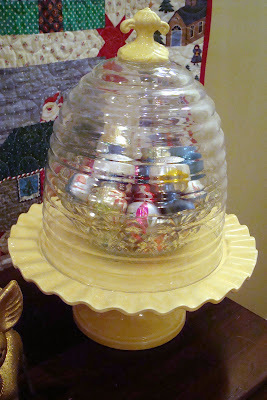 I have my vintage ornaments in a glass bowl under my beehive cake keeper and in a pretty glass jar. 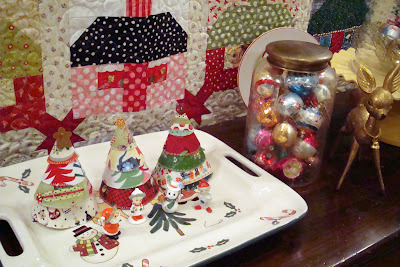 I set out things I made and gifts from friends in my favorite holiday collection. I put some foil covered chocolate balls in the beehive pot. Now if I could keep Allison from getting everyone to unwrap a chocolate ball for her! Of course I hung my kitchy Christmas wreath I made last year. I wish it was twice as big. But it makes me smile every time I see it. 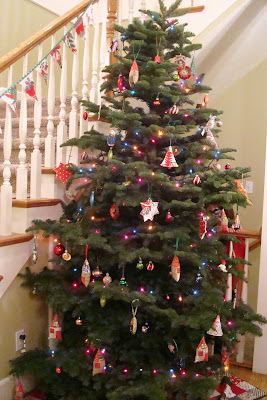 Mason went by himself and picked out the most beautiful (real) tree and got it at a great price. It is about 9' tall and smells fantastic. He always helps me trim the tree. It feels so good to have this all completed before busy December starts. Wishing you a sweet day with food and family. Don't you love vintage Fisher Price toys? 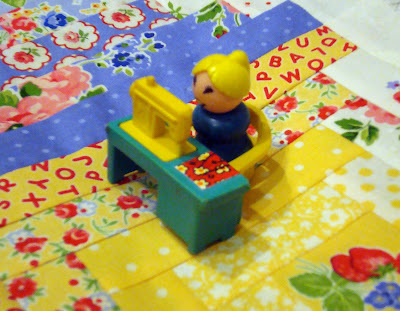 Shelbie has been making a collection of FP toys and recently acquired this darling sewing machine on Ebay. Isn't it so cute. I'll have to photograph some of her other fun things to show you sometime. Toys from childhood are so fun to have again. I've got nothing new to show you. It is Thanksgiving week and we are all super busy. I hope to carve out some time in between the kitchen and spending time with family to do some sewing and get my row by row quilt put together (cross your fingers for me). Today I'll be making pies with Allison. I hope I can apply what I learned at Laura's class. If things work out I'll snag a few pictures. These log cabins out of Pam's fabric are a joy to make. 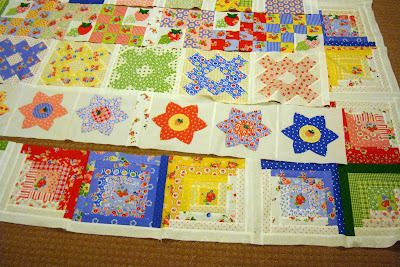 It may look like I'm making an entire log cabin quilt from the photo lay out above but I'm actually working on my row by row quilt border and it was just plain fun to see the blocks placed together. This is about all I got done this weekend. Time went by so fast. I do admit to playing with my Kindle Fire a bit. But I did get quite a few log cabin blocks constructed. They are just so pretty together. Super busy week ahead people. It is no secret that I love vintage fabric. 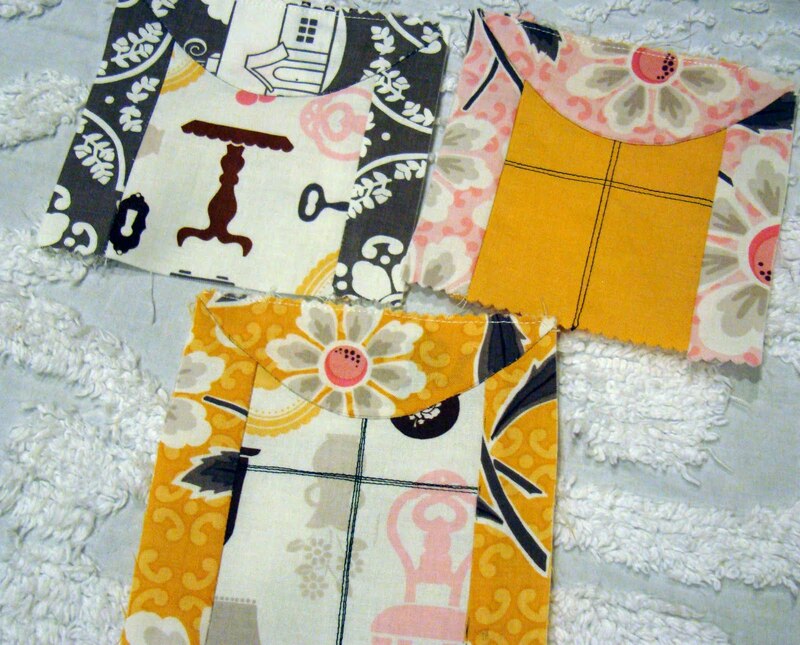 I really like putting even just a bit of vintage fabric in most all my quilts. 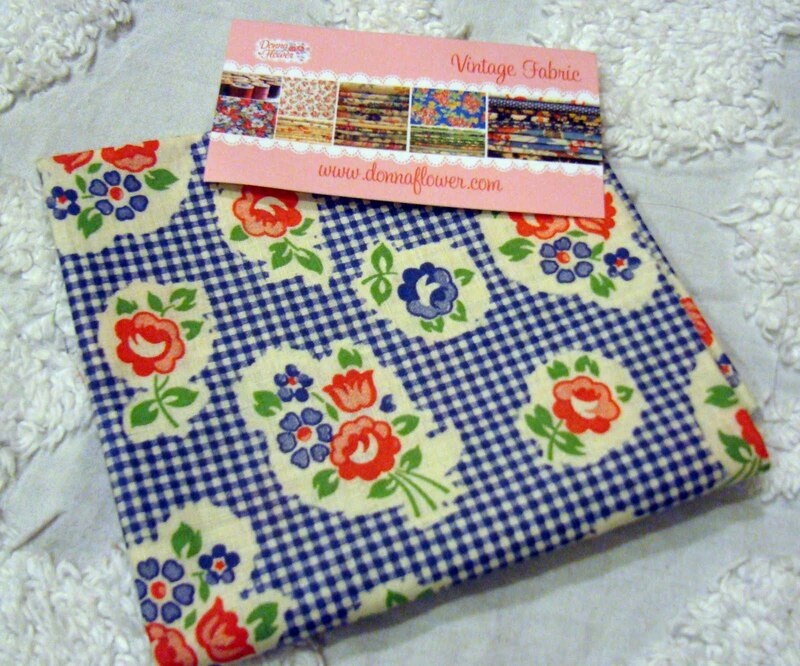 I'm such a fan of Donna Flower's vintage fabrics and her blog. I enjoy browsing and looking at her lovely fabrics and notions. I don't like to pass up a good grab bag. When I was a kid that illusive brown bag of penny candy or the grab bag at the 5 and Dime always made me beg my mother for change. When Donna offered the Snippets, Scraps and bits of Vintage Loveliness bags I was pulled right in. 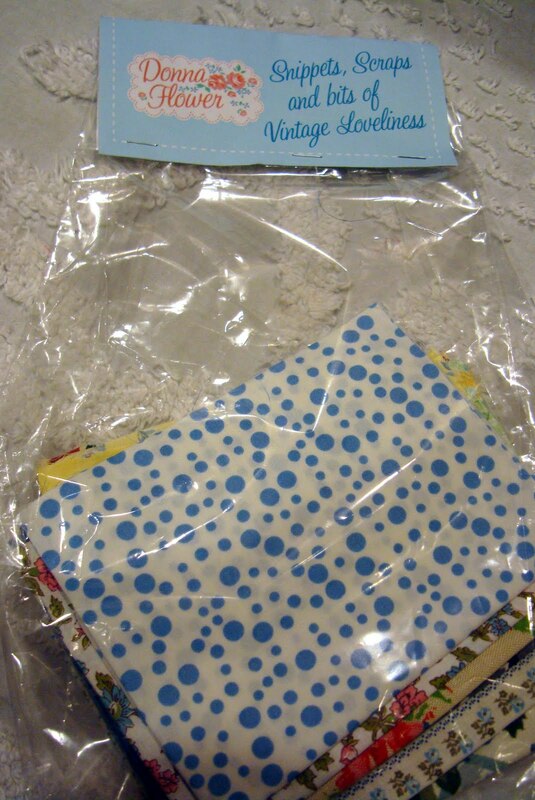 Look how lovely the vintage bits are packaged. They are so inviting. 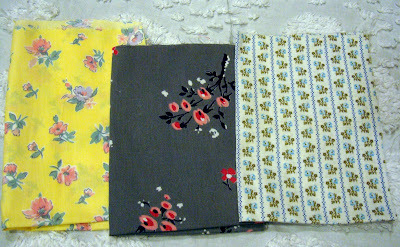 Donna sent me a fabric gift along with my fabric grab bag. It is so beautiful. 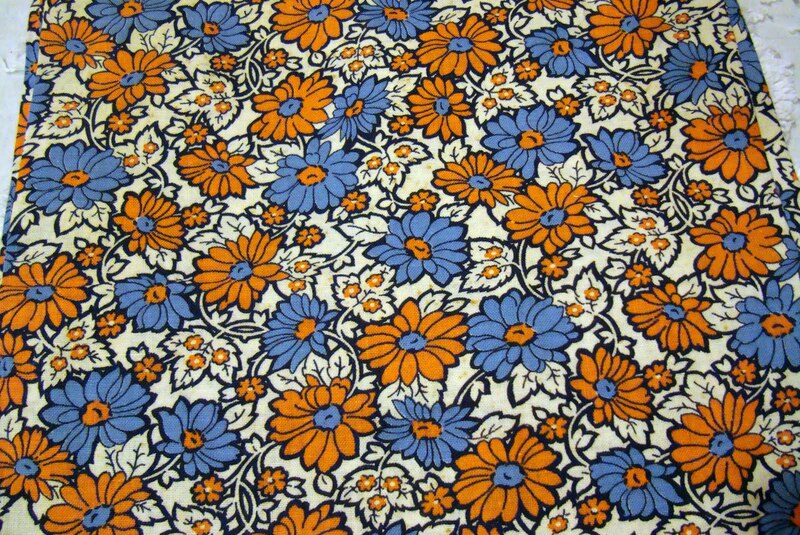 Doesn't it remind you of PKM fabric? 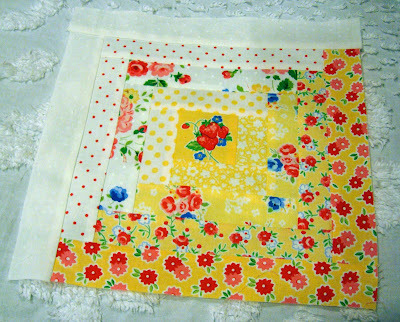 The pieces are all very sweet and I will put them in my fabric box with other lovely vintage scraps to use. Even just a touch of vintage fabric in a scrap quilt adds life. The prints are all very sweet. I may even put a bit of vintage into my current row by row quilt I'm making. It is such a busy time of year. I'm now over my little flu and ready to prep for Thanksgiving Day. Next week will be kind of crazy. I'm sure it will be busy at your house, too. Maybe I will get some time to sew over the weekend, though. Or should I put my Christmas things out? P.S. Happy Birthday to my sis Paula. How was your weekend? 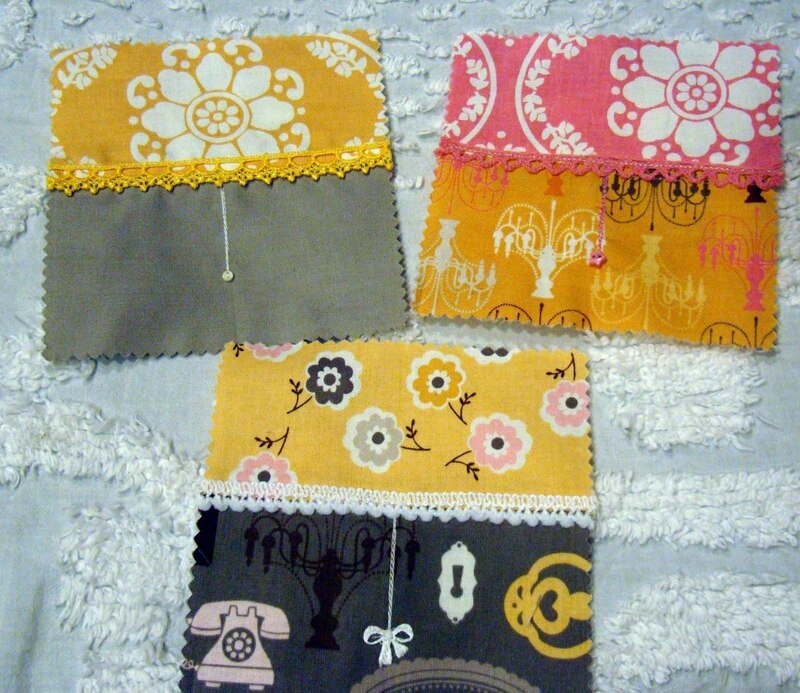 I had high sewing hopes for my weekend after a very stressful and long week. However, my hopes weren't exactly realized. But that is okay. I've got a new week ahead, after all. 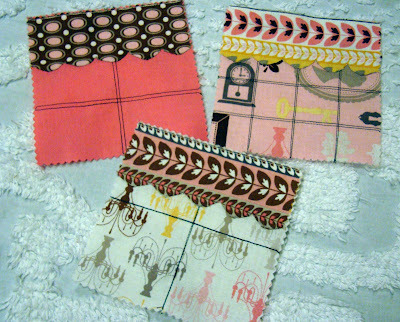 My Pam Kitty Morning came from Fat Quarter Shop so I was excited to get going on my last couple sets of blocks for my row by row quilt and I hoped to even start sashing over the weekend. But I was slightly derailed. Friday night Shelbie, Whitney and I went to my neighbor Laura's for a pie making class. It was very enlightening and helpful (also delicious). I have never made a good pie crust. Ever. I hope to change that during the Thanksgiving and Christmas season. No. I didn't make this pie above, Laura did. 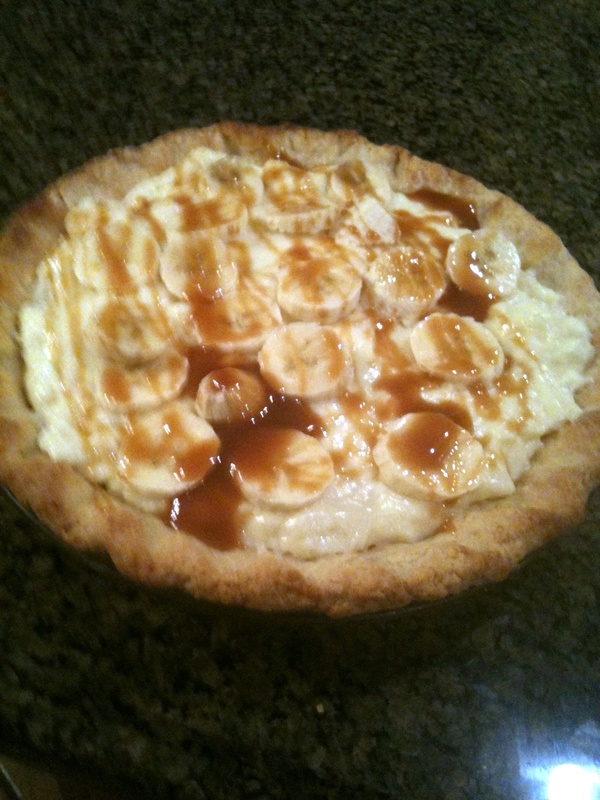 It is a caramel banana cream. Allison came to stay for a couple days. Of course that was a happy derail. Shelbie made Allison this super cute sweater and cap with her very talented knitting needles. 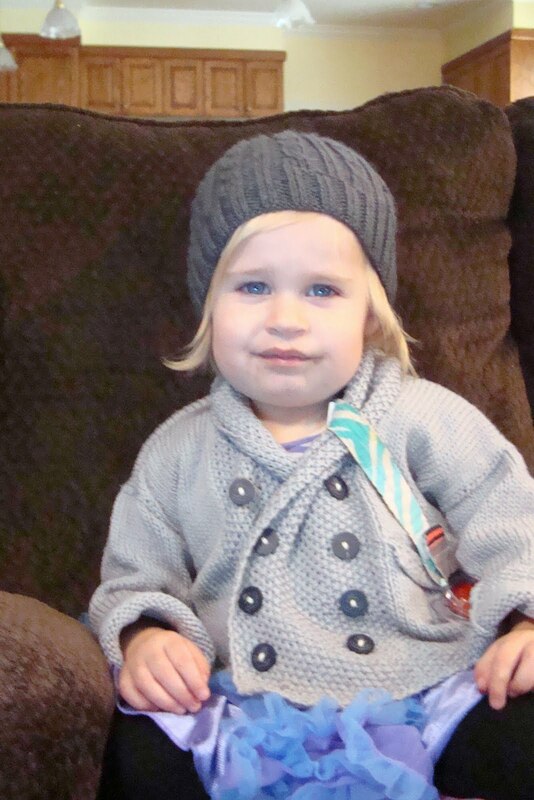 The sticky candy face is courtesy left over Halloween candy. She looks pretty happy with herself. I did manage a bit of sewing on Saturday. I cut out the 1.5" strips for my log cabin blocks in my row by row quilt. Can you just see that it doesn't matter what the block design is used, the PKM fabric is incredibly cute? I used the strawberries for the center block. I couldn't be happier with how they are coming together. Unfortunately this is all I got done. But I love it. I had been chasing a cold all week last week and it finally hit Friday. It really slowed me down over the weekend and hit hard on Sunday. I hope it doesn't last long. 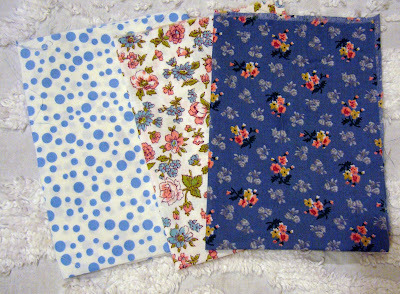 I just loving using this fabric too much to let a cold get me down. Thanks to you gals who responded to my questions about what to make for the Christmas season this year. Read the comments from readers of my last post. They are funny, and some good ideas. I love you guys. 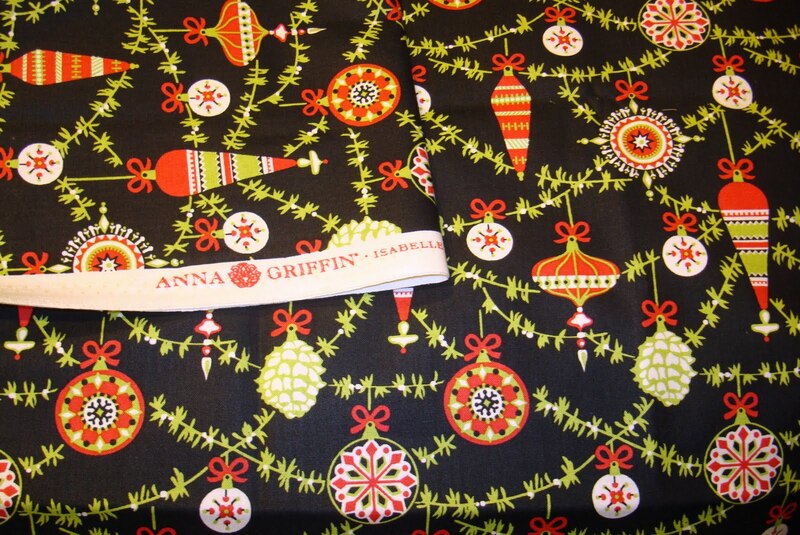 I'm such a fan of Anna Griffin's fabric. 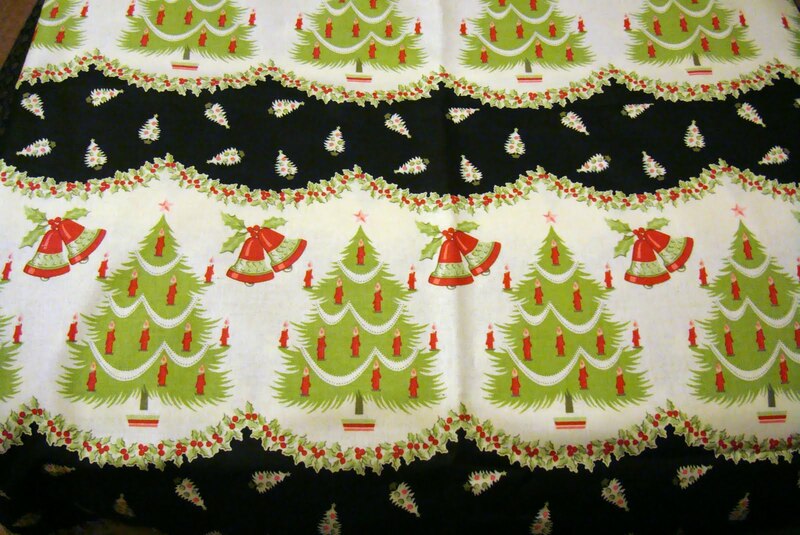 Her Christmas fabric is always beautiful. Well all her fabric is amazing. I have a few pieces from the Anna Griffin Isabelle line to show today. I think this is last year's line. Her new line is called Twinkle Bright, equally lovely. I really love the balls hanging on the tree. They look like crochet or hex signs. I always think black is a classic Christmas color - the color of night. This is perhaps my favorite from the Isabelle line. 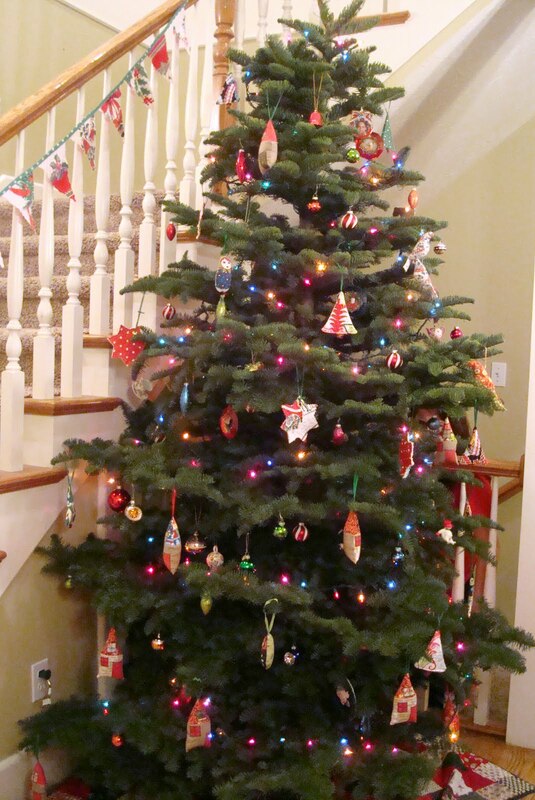 It is very vintage with the hanging bells and the trees with candles. I really love it. And the border repeats. 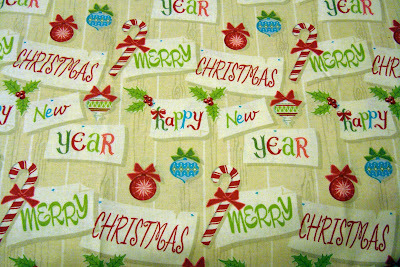 The lettering is very 50's and it is all set so perfect, kind of like the front of a vintage Christmas card. After complaining about stuffing I have to show you 2 ornaments I acquired through etsy. We won't rehearse my stuffing issue. But if someone else stuffs, I'm perfectly happy to use them. 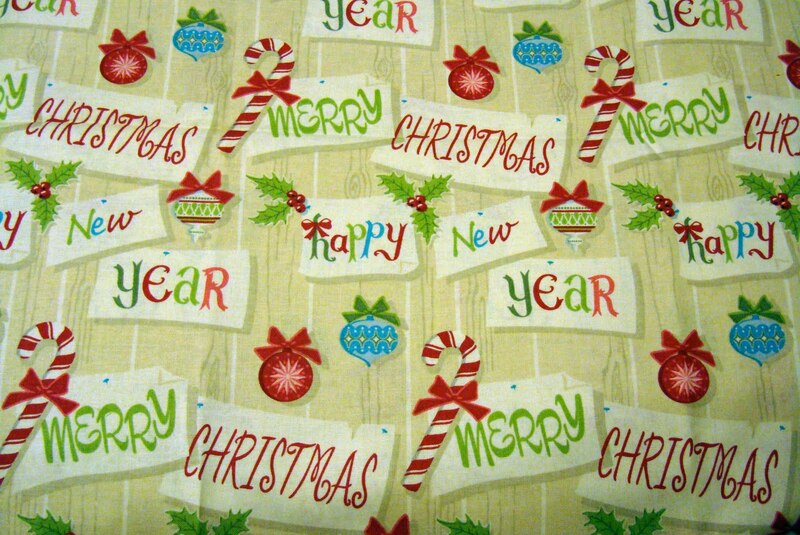 So what do I make with my Christmas fabric? I haven't decided, but again, I love all the suggestions. And who knows? This fabric just might sit on my shelf until next Christmas. I hope not but fabric this lovely never goes out of style. 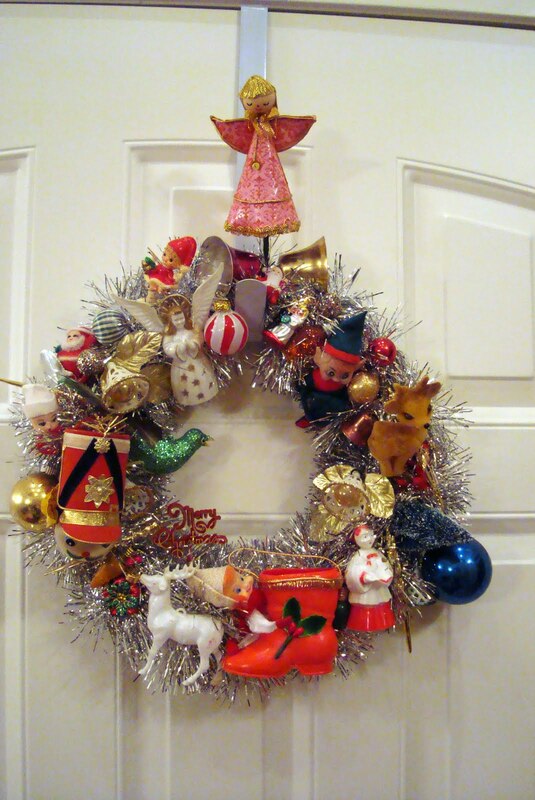 Even though it is early November, Christmas is coming like a runaway train. I finally admitted yesterday that I really don't like fall. It felt so freeing to admit that. And I've admitted here before that Christmas isn't my favorite holiday. So basically I'm a Grinch and I just like February to August. But that said, Christmas follows fall and it is coming at me (us). And I'm thinking of projects to make. I also hate to stuff. HATE it. I do like Thanksgiving stuffing but I hate stuffing with batting. 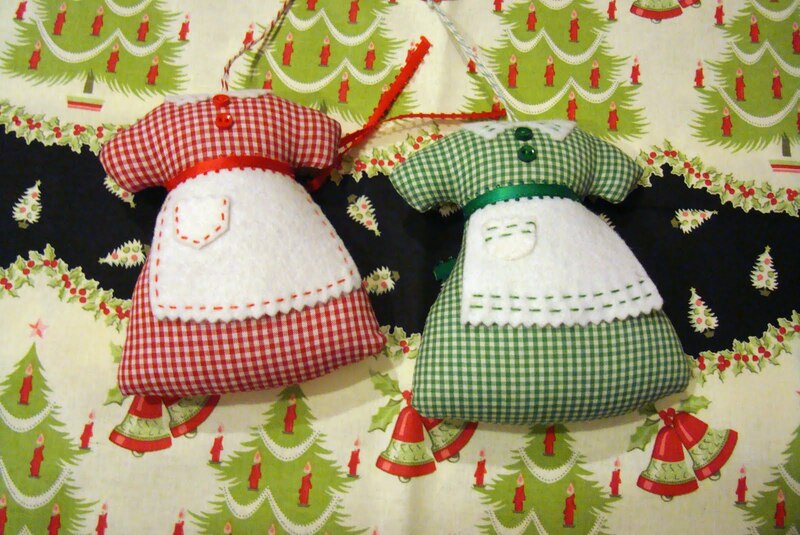 I made these house ornaments a couple years ago. 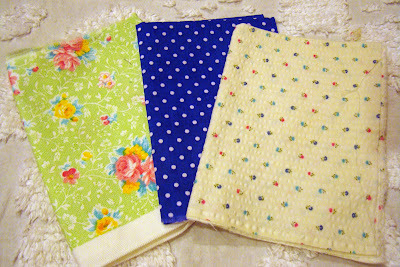 And I loved sewing them but I really didn't like the stuffing part. 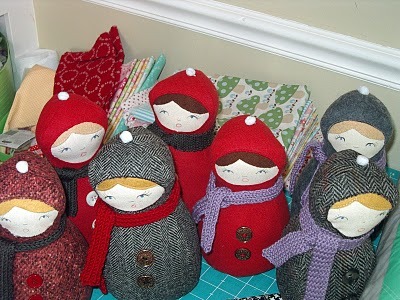 Last year I made these carolers. And the stuffing was really awful. Stitching popped and it seemed like each one held a bag of stuffing. But I see so many cute things around that are stuffed. 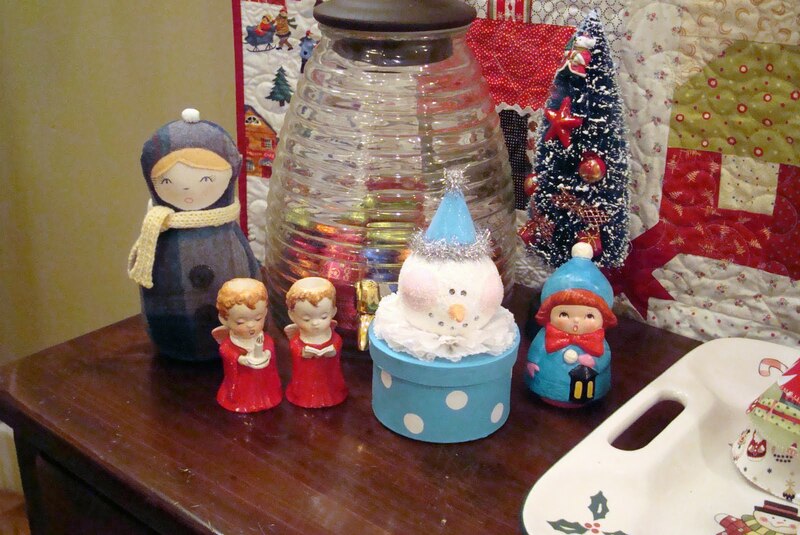 This tutorial is really making me want to make house ornaments again. Go see this tutorial HERE. Go. Do it. And then come back. Aren't they incredibly cute! 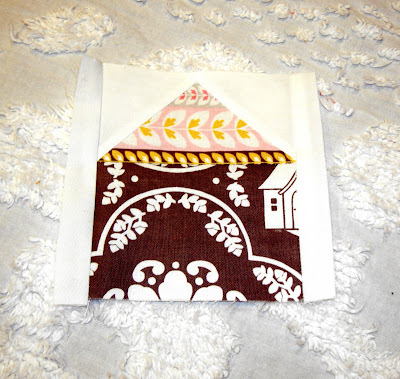 I am almost ready to make more house ornaments using this tutorial. But, there is the stuffing! I also hate glue guns. I have permanent scars from a past glue messes. But THESE trees are so so incredibly cute! I just tell myself thatI have no talent to make them. 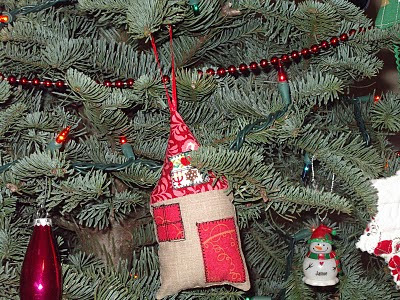 I made these fabric trees a couple years ago and then we made more this past summer with my sisters. So I do want to do something involving fabric, I think. But I've made these a couple times so I'm not wanting to repeat. 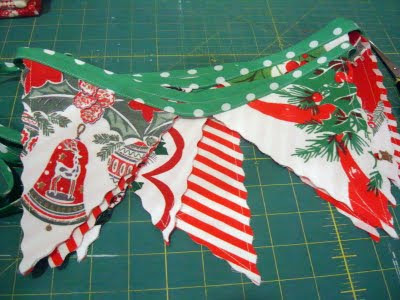 And speaking of repeats, I made Christmas banners from vintage tablecloths in the past. So, yeah...not wanting to repeat this either. Even though I liked making them. I love Sew Mama Sew tutorials and they always have some great things for Christmas. So maybe I'll spend some time in Pinterest and at SMS browsing. What are YOU making for Christmas this year? I want to know! I'm looking for just a couple good ideas. If your idea doesn't help me, maybe it will help someone else. So share, please. My squares are 5" unfinished and they are of 3 different window designs and 1 little house. This is the valance window. This is the swag window. This is the pullback curtain window. And this is the roller shade window. This is the mini house block. The blocks went together so quickly. 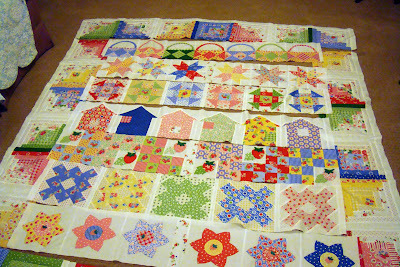 I made them all including applique in 1 day. 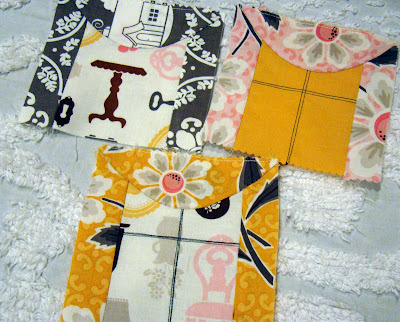 Of course I need to make more of them since they are 4.5" finished but it is a fun sized block and making all the blocks is full of creative enjoyment. I have a few other ideas for other blocks. We'll see how it goes. P.S. My friend and neighbor Laura is teaching cooking classes again. I'm taking her pie crust class on Friday. I can't wait. If you're interested, see Laura's blog for details. It is Friday. I can't believe it. It is the end to another busy week and the beginning of a new month. We are entering a crazy time of the year. 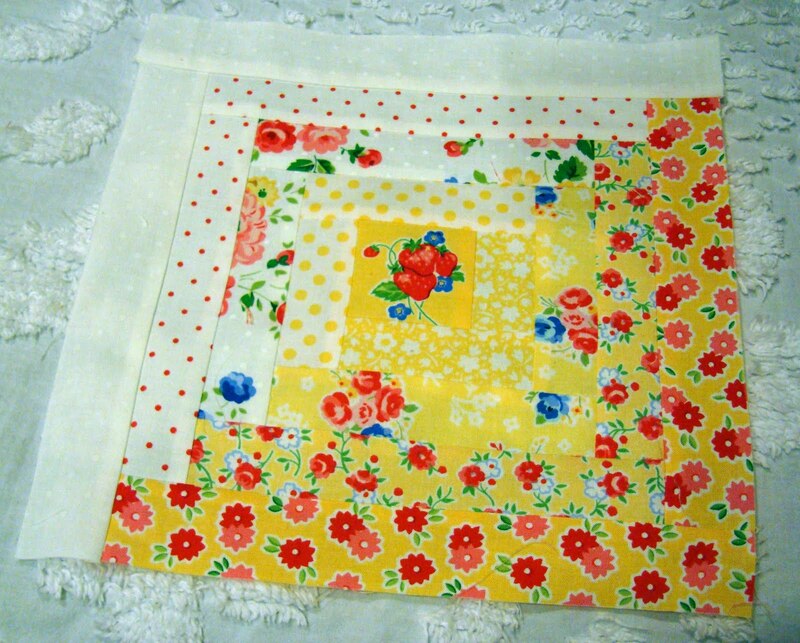 Snatching bits of time to sew keeps me sane even when life is off kilter. 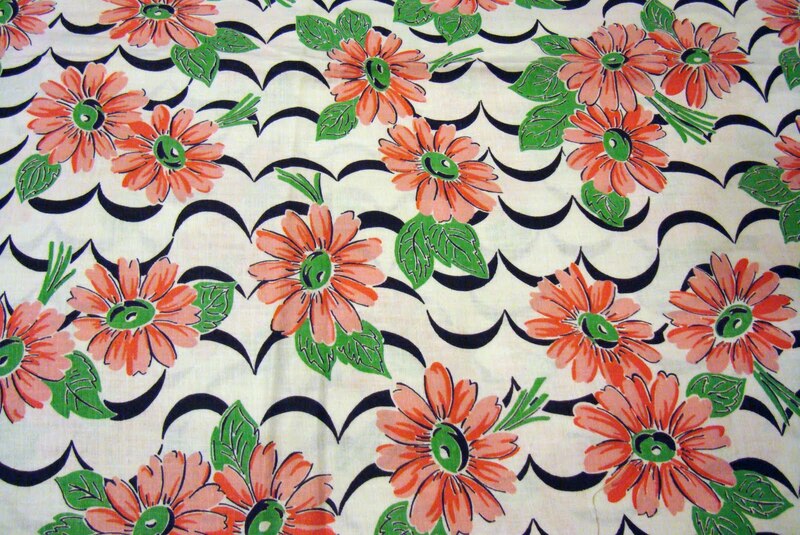 I like this vintage inspired fabric with daisies in a grid. I got them on sale. 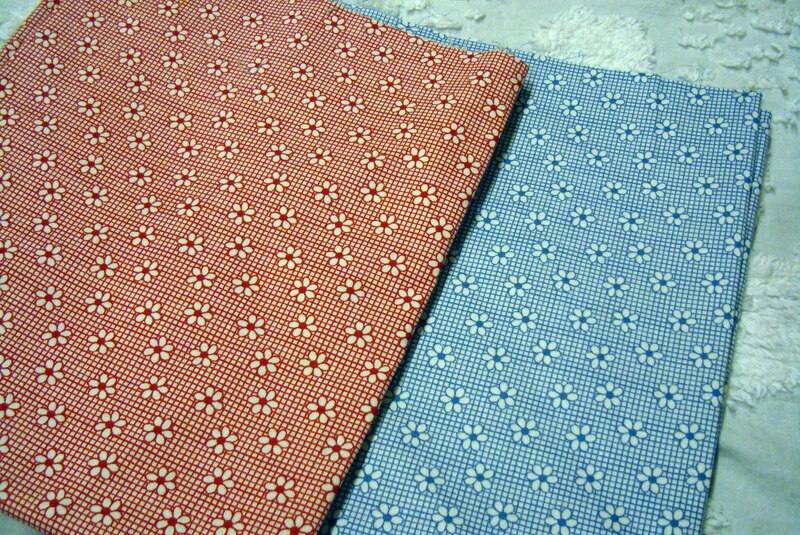 Red and blue are such a basic to my fabric stash. Speaking of daisies. 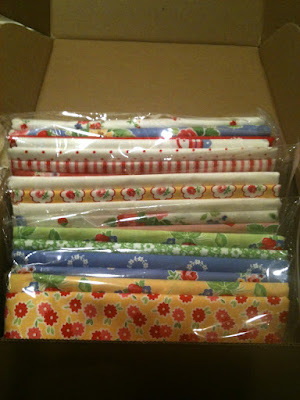 Lori's Daisy Cottage fabric is coming out this week into stores. I don't have any in my hands yet, but will soon. 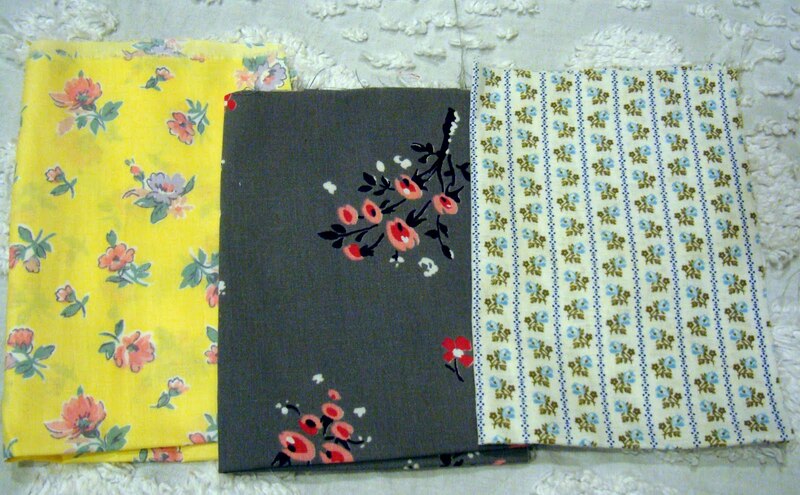 In the spirit of Daisy Cottage I thought I would show a couple vintage daisy fabrics I have. 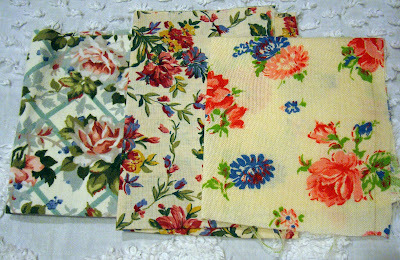 I love flowers in fabric. This is another daisy in a 70's vintage fabric. Blue and rust/brown were always paired together back in my high school and college days. I went through a time of hating 70's fabric but I love it now. 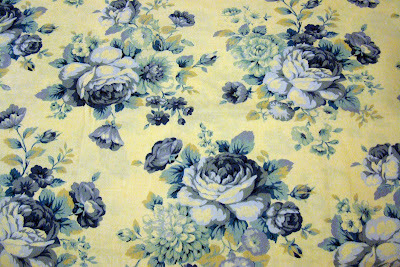 This floral rose fabric was given to me by my sweet friend in Texas, Elaine. Elaine's blog is Muddling Through. We have a lot in common and sometimes we muddle through together. Elaine knows I've been searching for the dress fabric shown in the photo below. 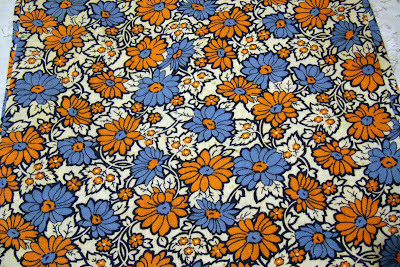 It is absolutely reminiscent of the blue fabric I was wearing. What a thoughtful treat for me. Elaine knew she had something in her stash similar and mailed it to me as a surprise. Thank you Elaine. 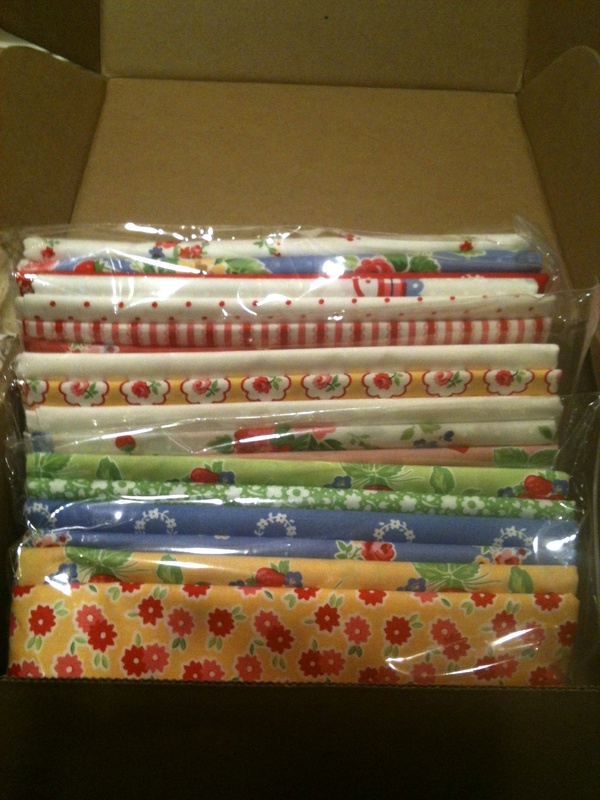 So many new fabrics will be bursting into the stores since Quilt Market is over now. It is exciting to see what is coming out. Happy Weekend everyone. Fall back to an extra hour of sleep. Yayy. I took some time off to be with my family. I didn't spend much time in my sewing room but I still have a tiny bit of progress to show on my row-by-row quilt featuring Pam's fabric. 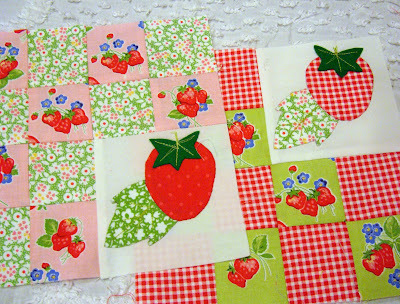 I finished all the applique in my strawberry patches blocks. I changed up which corner in the patchwork the strawberries are placed in. I thought it would make it fun to have the strawberries popping up all over in the patchwork. 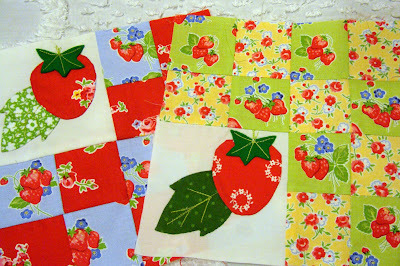 My next block is strawberry star flowers. 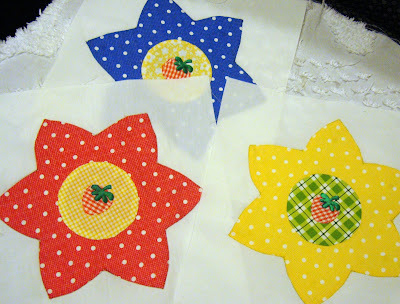 I used a pre-made strawberry applique inside each star flower center. That made them go really quickly. The little strawberry appliques I found on etsy. I got them from this shop. 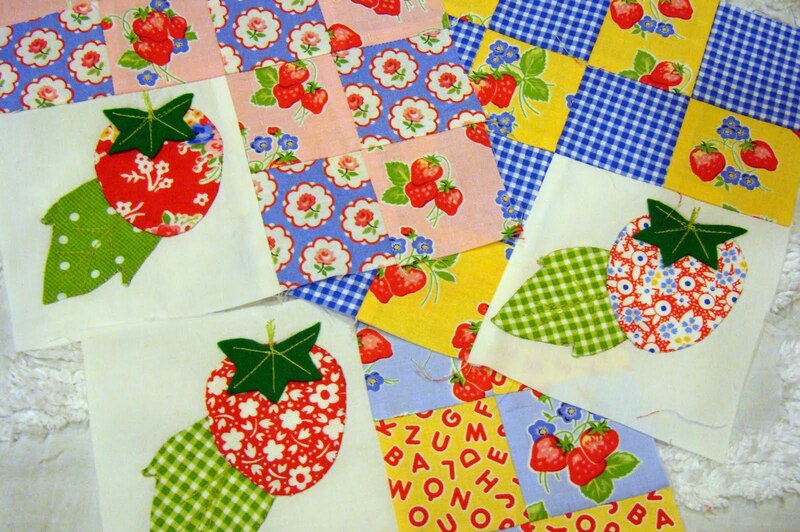 I just top stitched the strawberries in place. But really, it would be easy to make them and hand applique them just by downsizing my bigger strawberry applique.